Leaders of the country’s most prominent independent labor confederation were among six people charged on Monday over a protest that was violently dispersed by a group of tuk-tuk drivers outside the Phnom Penh office of the Capitol Tours bus company on Saturday, according to a court statement. 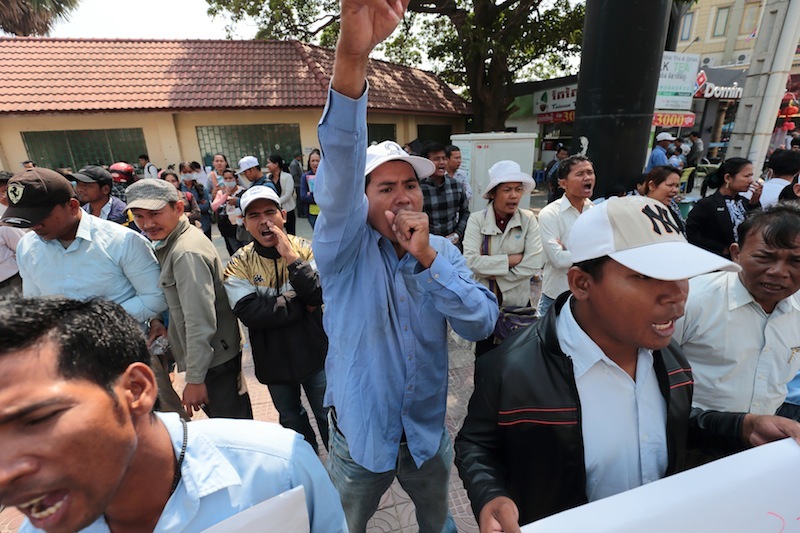 Ath Thorn, president of the Cambodian Labor Confederation, and Kong Athit, the group’s secretary-general, were named in a document from the Phnom Penh Municipal Court as individuals charged with intentional violence, obstructing public officials and obstructing a public road. Mr. Thorn said he had only heard about the charges. “I heard the court accused me but I didn’t see any letter from court yet,” he said, adding that he was not present when the violence occurred. “I think the court accused me because the company complained or police made a report to the court about the protest in which our members supported the drivers,” he said. The union leaders remained free on Monday, but two of the charged individuals—a fired Capitol Tours bus driver and a la­bor activist—were questioned on Monday after being arrested at the protest on Saturday, according to a statement signed by deputy prosecutor Srey Makny. At least 14 people were injured in the attack outside the company’s office and depot in Prampi Makara district’s Boeng Prolit commune, including protesting bus drivers, their supporters, a rights monitor and a police officer, according to a statement decrying the violence released by nearly three dozen rights groups, labor organizations and community associations. About 40 former Capitol drivers—who have been protesting for months over what they claim were unfair dismissals in retaliation for their efforts to unionize—gathered at about 8 a.m. on Saturday. After attempting about two hours later to block a bus from leaving the depot, they were set upon by some 50 tuk-tuk drivers, many of whom were wearing black helmets and wielding wooden sticks, metal bars and hammers, according to rights group Licadho. Police officers in riot gear participated in the attack, while other officers tried—unsuccessfully—to stop the violence, Licadho said. In a video posted online by the rights group, a man can be seen using a hammer to repeatedly smash a bus driver on the head and back. None of the tuk-tuk drivers—who are affiliated with the Cambodia for Confederation Development Association, which has count­ered similar protests in the past—were arrested. But despite the seemingly one-sided nature of the incident, a bus driver, Nan Vanna, and another protester, labor activist Ros Siphay, were apprehended when the violence subsided. On Monday, the two were questioned at the municipal court and jailed on charges of intentional violence, obstructing public officials and affecting public order, according to the court statement. The court named the other charged individuals as Chun Oeung and Eang Kimhun. Pat Samath, chief of police in Boeng Prolit commune, defended the inaction of his officers on Saturday morning, saying they had been scared. Mr. Samath referred further questions to district police chief Neth Sithon, whose officers, he said, made the arrests on Saturday. Mr. Sithon declined to comment. Capitol Tours has denied any involvement in the attack. Outside the company’s office on Monday, many of the same tuk-tuk drivers who attacked the protesters were still parked in the area, waiting for customers. CCDA vice president Suth Men­ghy, who was seated in a colleague’s tuk-tuk, said that while his members had been prepared for the fight, they did not start it. “I asked all my drivers to wear the helmets because I saw they were going to attack us with pipes and bamboo sticks,” he said angrily, showing reporters photographs of the poles the bus drivers had used to hold up banners. Mr. Menghy said his members purchased the helmets weeks ago, planning to use them to identify each other in the event of a clash. And despite admitting that the bus drivers made no moves to harm his men, he said they had initiated the conflict by acting aggressively, giving his men no choice but to lash out.